There are times when an invoice is waiting for updated payment information, or has a problem that cannot be resolved and is stopping a billing event from being sent. Institution and core administrators have the option to remove, or detach, an entire invoice from a billing event so the invoice with billing errors does not delay the billing process. NOTE: This functionality requires an institution setting that may not be enabled for your institution. When detaching an invoice, both the invoice and invoice number remain intact. More time is required by the core manager and core customer to resolve disputed charges on an invoice. The billing event has a status of File Sent, which indicates that all invoices on that billing event have already been sent to an institutional ERP for final processing. NOTE: Not all institutions allow detached invoices. Institution administration have authority over this process and determine whether or not core administrators have the ability to detach invoices from billing events. To detach an invoice, you must view the invoice itself. Navigate to the core's Billing tab to view your list of existing billing events that have a status of either "Billing Initialized" or "Draft", and find the billing event that contains the invoice(s) you would like to detach. Click on the appropriate invoice link to display a list of all invoices on that billing event. Open the invoice you wish to detach by selecting the magnifying glass icon to the far right. Once the invoice is open, select the "Detach Invoice" icon at the top of the invoice. The Detach Invoice window will open. A note may be entered in the field provided but it is not required. Click "Detach invoice" and the invoice will be removed from this billing event. A note stating that the invoice has been detached now displays at the top of the invoice. Once an invoice has been detached from a billing event, it can be located in multiple places. A detached invoice can be viewed within the "Invoices" link, found in the left-hand navigation menu under Core Facilities. A detached invoice can be easily identified by its red lettered "Detached" status. There is also a filter within the Invoices filter panel to search for detached invoices, allowing for easy aggregation of all detached invoices. A detached invoice will be automatically moved into the next Billing Event created for inclusion when ready. 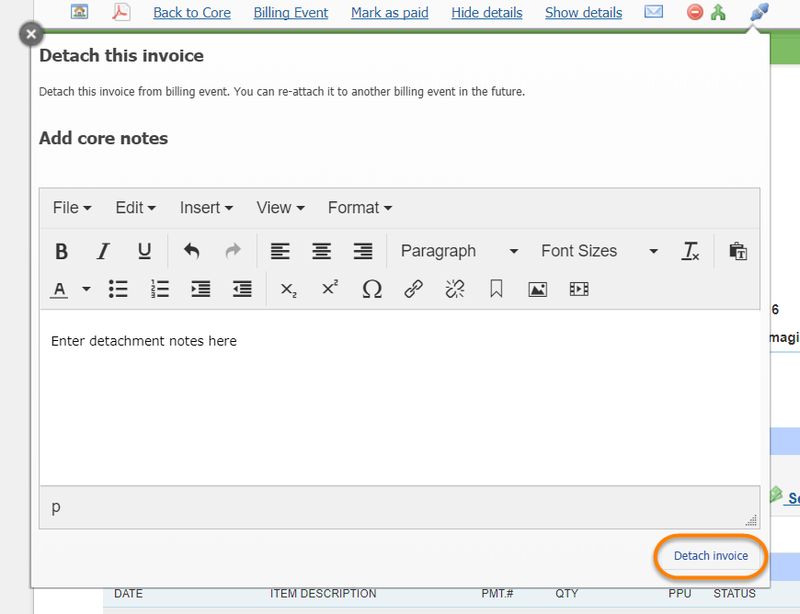 Selecting the checkbox next to the invoice will insert it into the new billing event. There is also an “Include” checkbox at the top of the list of detached invoices that, if selected, will automatically check off all detached invoices as ready to include in that billing event.